Hello. I'm Rory Chasen. Last month my lucky dog Pluckie visited Killer Characters, but now I'm back. I'm the main human in the Superstition Mystery Series which began last month with Lost Under A Ladder. As I mentioned when I was here before, I remain a skeptic even though I now live in Destiny, California. The town is all about superstitions. As a result, I keep hearing more and more of them. Most recently, people have started talking about Thanksgiving superstitions, which isn't surprising since it's November already and Thanksgiving is fast approaching. The one that's discussed most is the one about how the person who winds up with the largest part of a wishbone after breaking it with someone else is the one whose wish will come true. Most of those wishbones come from turkeys, so that superstition seems to go with Thanksgiving. Even so, a lot of wishbones are broken here year-round in Destiny, mostly because they're given out with all orders at the Wishbones to Go Eatery. There are other Thanksgiving superstitions, too. For example, did you know that if you knock three times on a wooden board before putting your turkey in the oven it'll come out tasting better? Also, if you happen to be living with relatives or renting a house or apartment, be sure to prepare an entire Thanksgiving dinner by yourself--and next year you'll get to serve one in a house of your own. If you're cheerful on Thanksgiving, you'll have lots more happy days before the year ends. But if you're still hungry when you finish your own Thanksgiving dinner and resort to helping a child finish his or her meal, if it's a boy that kid will become naughty, and if it's a girl she'll cry. Okay, do I believe in any of these? Hard to say. I'm still really skeptical about superstitions. But it's difficult not to at least pretend to believe, with all of my new friends and neighbors telling me these and others with a straight face. After all, superstitions are what encourage tourists to come to Destiny to check out our town--and since I'm running the Lucky Dog Boutique I love to have lots of tourists visit us. How about you--do you have a favorite Thanksgiving superstition? 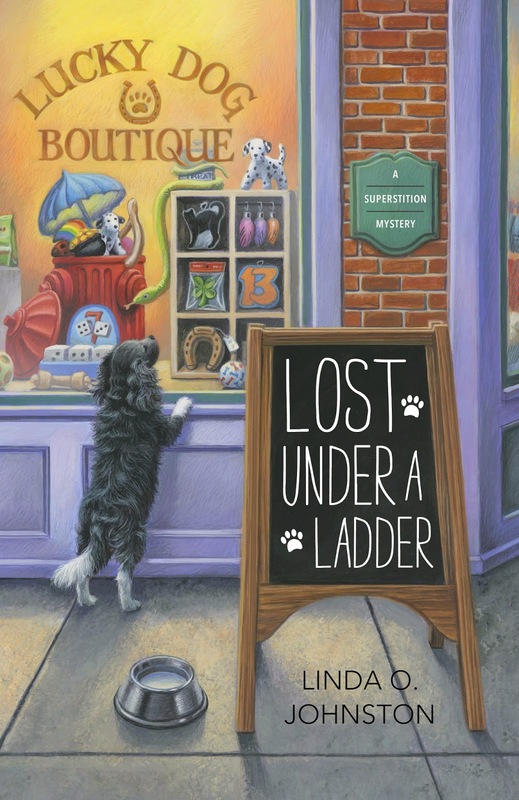 LOST UNDER A LADDER, the first Superstition Mystery by Linda O. Johnston, is an October 2014 release from Midnight Ink. I must admit that I've never heard of these Thanksgiving superstitions before. But I'm looking forward to reading this new series. I completely get that one, Willow. Thanks for the thanksgiving superstitions, Rory. I don't have any superstitions for thanksgiving myself, but these sound like they could be the real deal.